Where to eat in Baltimore and save at the same time! So you’re wondering where to eat in Baltimore eh? Well we have some great places you can visit and save money at the same time. Before we dive in, please allow me to remind you that we have hundreds of local businesses registered in our App. Second all the deals, coupons and discounts are exclusive to our App. Meaning you can’t find these coupons anywhere else. Lastly, you’ll find hundreds of places to eat in Baltimore. Thereby we highly encourage you to download our App so that you leverage its true empowerment. As you know each restaurant, pub or cafe are all unique and special in their own way. In other words the best restaurants to eat in Baltimore is actually subjective, this depending on your own personal taste. So what I’d like to do instead is to give you all kinds of different options where you can choose from. For instance if you’re in the mood for Italian, Seafood, Mexican or want a more quiet places to dine in, or even a more fun environment with drinks, music and great crowd like pubs. I want to make it simple for you to choose a place according to your mood and needs of the moment. I’ll also mention a few of the hundreds of discounts you can leverage when visiting places to eat out in Baltimore. In the mood for great seafood? 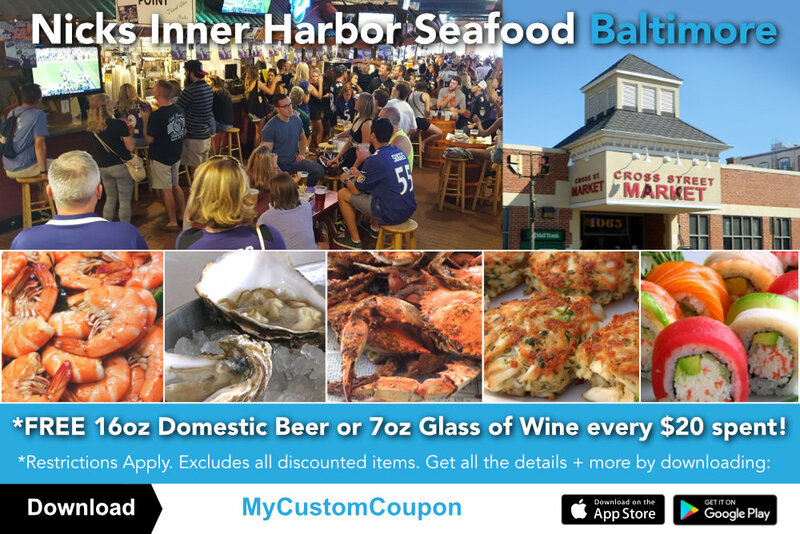 Now remember that in order get the entire list of seafood places to eat in Baltimore and the special offers, you will have to download the app. Also keep in mind that every deal and merchant has their own set of restrictions, rules and details that you must comply with. 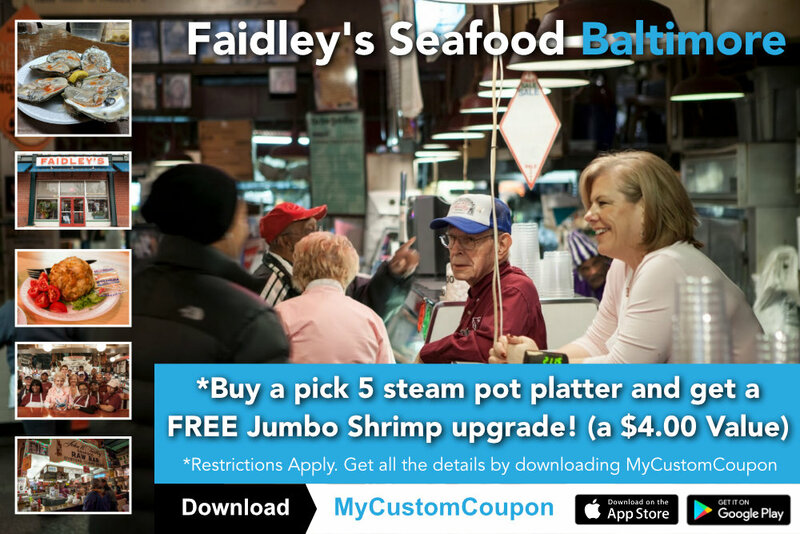 If you’re in the mood for some great seafood, we invite you to discover this awesome deal at Faidley’s Seafood. Want even more? Awesome. 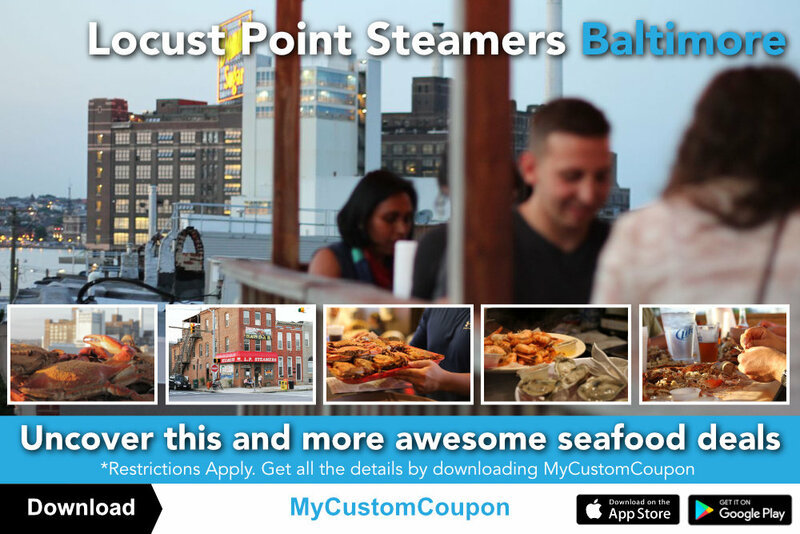 If you’re also in the mood for a cold beer accompanied by some Maryland Steamed Crabs, you probably won’t find a better place than Locust Point Steamers right in the heart of Baltimore City Maryland! Ok, if you love and can appreciate live music along with a great crowd and an all classic American traditional sandwiches and food, we recommend you visit the Fells Point Tavern in Baltimore. In case you want to check this place out, here’s an offer you won’t be able to resist. We really hope you enjoy some of these places to eat in Baltimore, and be sure to let us know how it went. Keep checking back as we will continually add more good restaurants in Baltimore Maryland for you to visit with friends, family or co-workers.